Looking for a business of your own that allows you to choose your working hours and enjoy a balanced lifestyle? Housework Heroes could be the ideal business for you. Established in Perth in 2001, Housework Heroes has grown to become a dominant player in the domestic cleaning industry in Australia. Housework Heroes is part of the Mpower Franchising Group which also owns Car Care – Australia’s largest mobile car detailing franchise. 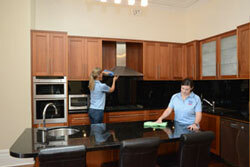 During 2010, Housework Heroes continued to expand, with the purchase of United Home Services, based in Melbourne. United Home Services offers home and office cleaning, carpet cleaning, ironing and gardening services and featured in BRW magazine’s Fastest Growing Franchise list in Australia for the last six years. Currently, Housework Heroes/UHS has around 160 franchisees across all states, and has become one of Australia’s largest domestic cleaning franchises. Our aim is to expand further in 2014 and so we have opportunities available in all states and major towns. The business ranked in BRW Magazine’s annual franchise report for 2005, 2006 & 2007. The world is changing rapidly. No longer is it just the wealthy who consider domestic help. As more and more women pursue their own careers, the need for help in the home continues to grow. The Housework Heroes system allows you to take full advantage of this changing pattern and trend in household management. The busy people who make up most of Housework Heroes clientele know that a clean, neat house creates a happy living environment. But their busy lifestyle leaves them with little time for cleaning the home. Cleaning a home to the high standard people want and are willing to pay for means having the right equipment and the knowledge that guarantees satisfaction. We’ll give you that knowledge and train you to produce immaculate results every time. Owning your own business could not be easier. For one low investment you own a Housework Heroes exclusive franchise territory. It’s your territory and bookings in that area are phoned through from our central office. It means you have customers from day one and this builds as you get into your own routine. You’re on your way to financial security. Housework Heroes have developed a complete business system to ensure you are equipped with all the knowledge and equipment you need to begin making money immediately. The Housework Heroes Cleaning Franchise package includes comprehensive training in all areas of running your own business, a complete equipment package, a range of marketing materials, stationery including business cards, receipt/invoice books etc and Housework Heroes Franchise Owners Manuals. Whilst you are undertaking your training, preliminary marketing is commenced to ensure you have a customer base in your territory from your first day of operations. As your business develops, you may wish to employ or sub-contract additional personnel to help cope with the demand. We have three packages available to you – “Roaming”, “Territory” and “Area”. This is a fantastic beginning for people who have not run a business before, or need to start on a budget. Roaming franchisees are able to work as much as they like which means they are in full control of their income. There are limits to a Roaming Franchise and people who wish to build a larger business can treat this as a great step towards upgrading to a Territory Franchise. A great benefit of our Roaming Franchise is the very low investment required. You are able to build a cleaning business with similar incomes to other franchise companies but at half the investment. And as you can see below you still get everything you need to get a great start in your business. This franchise opportunity will suit those who don’t mind getting involved in providing the service but also would like the opportunity to grow their business in the future by getting others to help them. Territory Franchisees receive their very own exclusive marketing territory – and can develop their business through employees or contractors as their customer base grows. This franchise opportunity will suit those with some management experience who want to own a home services business but don’t necessarily want to do the work. Area Franchisees receive a larger area – up to 10 times that of a Territory Franchisee – and can develop their business through employees or contractors. There are virtually no limits to what you can achieve with this opportunity. To find out more about the opportunities available, please fill in the request information form.